Comments: Hispid cotton rats forage at dusk and dawn and rarely store their food. Their bristly fur is yellowish-brown with flecks of black and gray on top and whitish-gray below. Unlike other rats, their tails are relatively short. Females can produce many litters from spring through fall with 7-9 young per litter. Average lifespan in the wild is less than one year. Distribution: Hispid cotton rats range from South America to the southeast and the south-central United States. They live in prairies, uncultivated croplands, shrublands, and wetlands of Kansas. 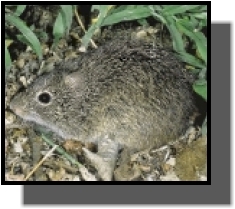 Food: Hispid cotton rats feed on grass stems, leaves, seeds, grains, cotton, insects, and small vertebrates, including mice and fledgling birds.